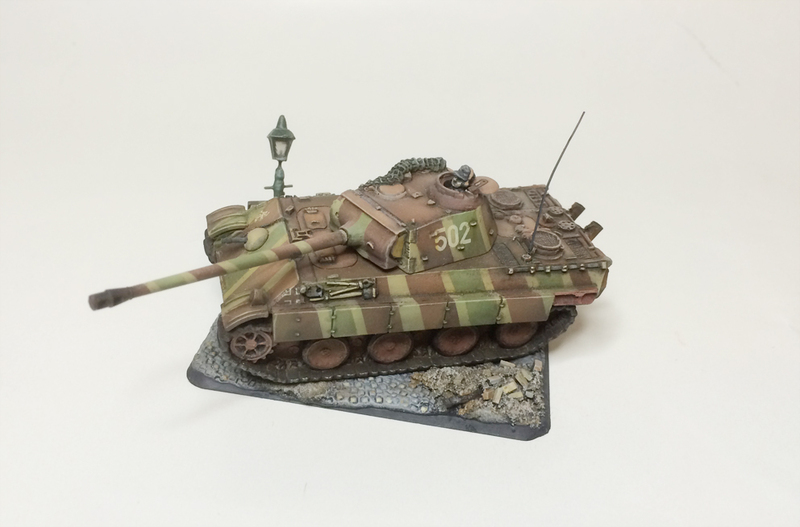 Of all the German WW2 tanks, the Panther offers perhaps the most variety in possible camo schemes. I have always been intrigued by the striped patterns of the -45 Panthers. Not only good looking, it also presents a nice challenge to the painter. I painted this piece to try out what my painting buddies call “gift wrap camo”. 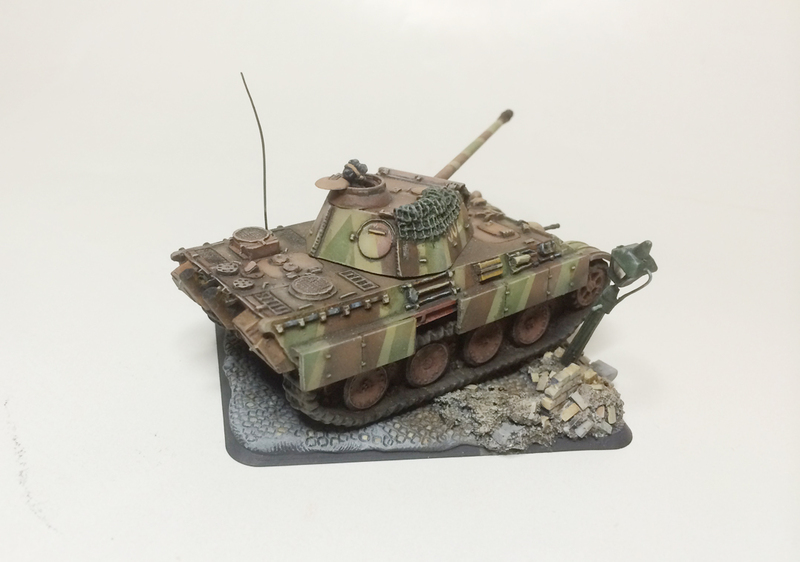 I have mainly used Panzer Putty as my method of camp painting, but this time I went for the old school masking tape. Also, I wanted to emphasize color modulation on this piece. 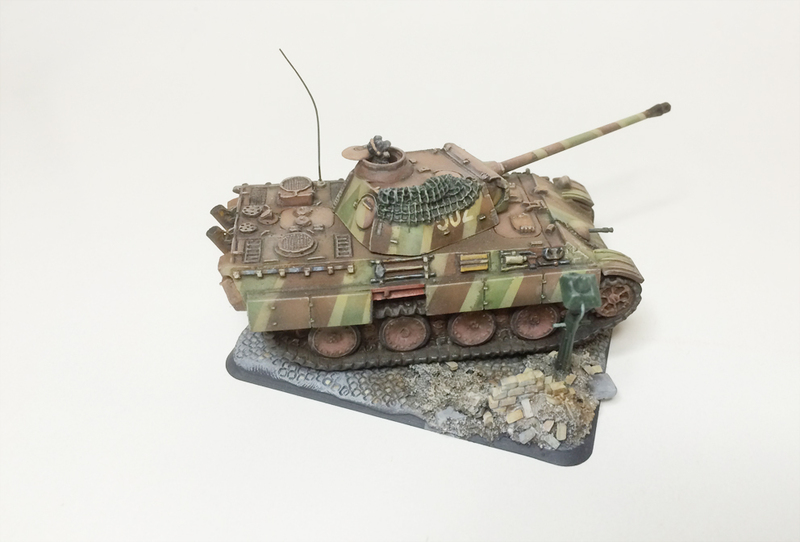 The kit itself is standard Battlefront Miniatures’ Panther G resin hull combined with white metal tracks from a Panther A kit. I had to make do with the inferior metal tracks as the newer plastic ones from the Panther G kit are sadly incompatible with the Schürzen ( if you like to call the Panther’s side protection plates that…), and I really needed to include those to increase the paintable surface to really bring out the camo scheme. The turret is from BF’s Jochen Peiper kit. I decided to mount the tank on a self sculpted base to give the it a little something to contrast with. Not a huge success there but then again, the Panther itself is the main attraction in this piece. I am quite happy with the overall look and feel of the Panther. 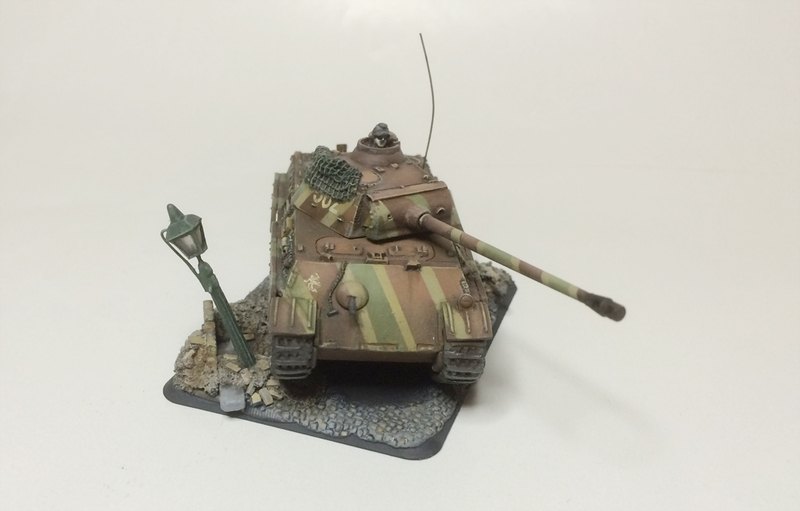 With Battlefront’s all plastic Panther G kit coming out next month I’m definately going to paint up a force of them using this one as a guideline.